When we consider that the ionosphere surrounding our planet is electrically positive charged whilst the earth's surface carries a negative charge, we must conclude that this amounts to a prevailing electrical tension within the earth/ionosphere cavity. This tension is discharged when thunderstorms develop in this cavity. In physics two concentric electrically charged balls, one placed inside the other, are called ball condensers, or capacitors. The inside of the ionosphere layer is used in wireless information transfer to bounce off radio waves emitted by transmitters on the earth's surface. In this way the information can be transferred over large distances. The physicist and inventor Nikola Tesla was the first to carry out wireless energy experiments at Colorado Springs, USA, which produced such powerful electrical tensions that they resulted in the creation of artificial lightning. These lightning flashes also produced radio waves. Due to their extremely low frequency these waves could penetrate the earth without resistance and thereby Tesla discovered the resonance frequency of the earth. Unfortunately Tesla was before his time and his discoveries were not taken seriously (see "Transition to The Age of Frequencies - Schumann Waves, Weather and Mind Control"). It wasn't until more than half a century later in 1952, when the German physicist Professor Winfried Otto Schumann of the Technical University of Munich predicted that there are electromagnetic standing waves in the atmosphere, within the cavity formed by the surface of the earth and the ionosphere. This came about by Schumann teaching his students about the physics of electricity. During a lesson about ball condensers he asked them to calculate the frequency between the inner and outer ball, meaning the earth and ionosphere layer. They came up with a calculation of 10Hz. This was confirmed in 1954 when measurements by Schumann and König detected resonances at a main frequency of 7.83 Hz. In the years following this discovery, several investigators worldwide have researched "Schumann resonance" and a number of properties and characteristics have now been established. The spherical earth-ionosphere cavity is created by the conductive surface of the earth and the outer boundary of the ionosphere, separated by non-conducting air. Electromagnetic impulses are generated by electrical discharges such as lightning, the main excitation source, and spread laterally into the cavity. Lightning discharges have a "high-frequency component", involving frequencies between 1 kHz and 30 kHz, followed by a "low-frequency component" consisting of waves and frequencies below 2 kHz and gradually increasing amplitude. This produces electromagnetic waves in the very low frequency (VLF) and extremely low frequency (ELF) ranges. ELF waves at 3 Hz to 300 Hz are propagated as more or less strongly attenuated waves in the space between the earth and the ionosphere, which provides a waveguide for the signals. "approximately equal to the wavelength which an electromagnetic wave with a frequency of about 7.8 Hz would have in free space"
It is the waves of this frequency and its harmonics at 14, 20, 26, 33, 39 and 45 Hz that form Schumann Resonances. On a global scale the total resonant spectrum is the effect of the global lightning worldwide which is estimated at an average of 100 strokes per second. Since there is a concentration of lightning activity during the afternoon in Southeast Asia, Africa and America there are Schumann Resonance amplitude peaks at 10, 16 and 22 UT (universal time), with activity over America around 22 UT being dominant. There are also +/-0.5 Hz variations in the center frequency, caused by a diurnal increase in ionization of the ionosphere as a result of radiation from the sun, having the effect of reducing the height of the ionosphere at 12 local time. Another factor which influences center frequency is sunspot activity. Although the existence of the Schumann Resonance is an established scientific fact, there are very few scientists who are aware of the importance of this frequency as a tuning fork for Life. I propose that it is not merely a phenomenon caused by lightning in the atmosphere, but a very important electromagnetic standing wave, acting as background frequency and influencing biological oscillators within the mammalian brain. Natural electromagnetic processes in the environment (I-IV), human EEG readings in comparison. show a noticeable similarity in their temporal variation. At the time when Schumann published his research results in the journal 'Technische Physik', Dr Ankermueller, a physician, immediately made the connection between the Schumann resonance and the alpha rhythm of brainwaves. He found the thought of the earth having the same natural resonance as the brain very exciting and contacted Professor Schumann, who in turn asked a doctorate candidate to look into this phenomenon. This candidate was Herbert König who became Schumann's successor at Munich University. König demonstrated a correlation between Schumann Resonances and brain rhythms. He compared human EEG recordings with natural electromagnetic fields of the environment (1979) and found that the main frequency produced by Schumann oscillations is very close to the frequency of alpha rhythms. Dr König carried out further measurements of Schumann resonance and eventually arrived at a frequency of exactly 7.83 Hz, which is even more interesting, as this frequency is one which applies to mammals. For instance, septal driving of the hippocampal rhythm in rats has been found to have a minimum threshold at 7.7 Hz (Gray, 1982). One of the foremost researchers in this field is Dr Wolfgang Ludwig, who has been investigating Schumann Resonance and its place in nature for many years. It was Dr Wolfgang Ludwig who carried out further measurements whilst writing his thesis on the Schumann Resonance. His aim was to measure what kind of natural signals actually exist in a healthy environment. 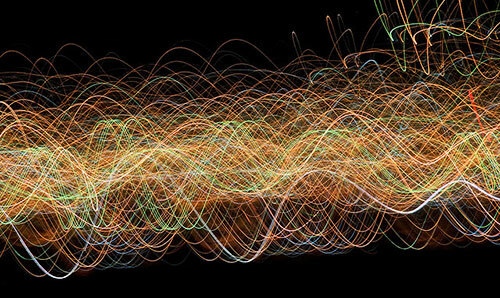 He became aware of the fact that due to manmade electromagnetic signals within the atmosphere, the accurate measurement of Schumann waves was almost impossible in the city. For this reason he decided to take measurements out at sea where, due to good electrical conductivity, the Schumann waves are stronger. He than had the idea to take underground measurements in mines. Here he recognized that the magnetic field of the earth fluctuated too. This was also investigated by Dr Robert Becker in his book 'Electricity and Vitality: The spark of Life'. Dr Ludwig came up with an excellent idea to take accurate measurements. When taking measurements at the earth's surface, the reading is the result of two signals, one coming from above and one from below. But subsequently taking measurements below ground makes it possible to come up with exact readings by separating the two. This description fits the relatively strong signal of the Schumann wave surrounding our planet being YANG and the weaker geomagnetic waves coming from below, from within the planet, being the YIN signal. The Chinese teachings state that to achieve perfect health, both signals must be in balance. Dr Ludwig found that this is indeed the case. He writes in his book 'Informative Medizin' that research carried out by E. Jacobi at the University of Duesseldorf showed that the one sided use of Schumann (YANG) wave simulation without the geomagnetic (YIN) signal caused serious health problems. On the other hand, the absence of Schumann waves creates a similar situation. Professor R. Wever from the Max Planck Institute for Behavioral Physiology in Erling-Andechs, built an underground bunker which completely screened out magnetic fields. Student volunteers lived there for four weeks in this hermetically sealed environment. Professor Wever noted that the student's circadian rhythms diverged and that they suffered emotional distress and migraine headaches. As they were young and healthy, no serious health conditions arose, which would not have been the case with older people or people with a compromised immune system. After only a brief exposure to 7.8 Hz (the very frequency which had been screened out), the volunteers health stabilized again. All the aforesaid points to the fact that the ancient teachings are correct. Although Schumann Resonance could easily be confirmed by measurements at the time of its discovery, it is no longer so obvious due to our atmosphere being filled with manmade radiation noise at different frequencies. This is almost drowning out the natural signals - signals that have been there through eons of evolution. It is possible that these signals act like a natural tuning fork, not just for the biological oscillators of the brain, but for all processes of life. With the advent of new wireless technology, in particular microwaves pulsed at frequencies close to Schumann Resonance as in mobile telephony, another threat is emerging. We may be creating an environment that is literally 'out of tune' with Nature itself. And it is at this point that there is an urgent need for us to understand how everything alive responds to the most subtle changes in magnetic and electromagnetic fields surrounding us. For instance, we need to examine the possible interaction between magnetite crystals within cells and manmade magnetic fields in the environment. There is a great need for independent research into the bio-compatibility between natural and manmade signals. By linking together the potential importance of Schumann Resonance and the dangers posed by manmade pulsed frequencies, it will become apparent that unless we find a way to use bio-compatible signals to power new technology, we may expose all life to dangers previously not encountered. We may have to pay a high price for this shortsightedness. Serious attention must now be paid to the possible biological role of standing waves in the atmosphere, so that we do not overlook the importance of oscillations in nature that may be central to consciousness and life itself. If organisms do in fact respond to, and perhaps depend on, electromagnetic fields as weak as that produced by Schumann resonance at 0.22-1.12 mV/m - millivolts per meter (from Cherry, 2002), this is of major significance for the development of present and future wireless technologies. Funding for research projects investigating the Schumann Resonance Effect is now being sought and scientists who support this call for research are invited to contact by e-mail. Gray, J.A., 1982 - The Neuropsychology of Anxiety: An Enquiry into the Functions of the Septo-Hippocampal System. Clarendon Press.